I, CHIU HOK YIN, have been very fond of traditional martial arts since as a child. 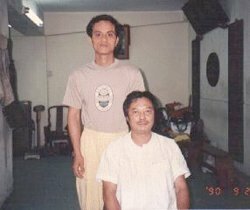 In my early years, I followed my late master, Wong Shun Leung, to learn martial arts diligently. With his patience in teaching me for a long period, I have been benefited from it profoundly. 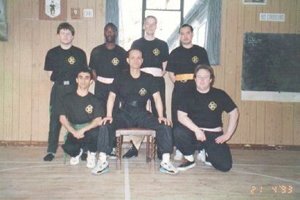 Besides making my every endeavor to practice Ving Tsun, I have also been trying out and exchanging the techniques of martial arts with other outside schools between 1975 and 1987. In 1984, I participated in the Guangdong Hong Kong Macau Wushu Fighting Invitation Match as a representative of my master's martial arts association. After I had won the outstanding award, my master awarded a certificate to me and encouraged me to operate a martial art institution in order to enhance and glorify Ving Tsun by providing more chances for people to learn it. That's the reason why I have founded CHIU HOK YIN VING TSUN MARTIAL-ARTS ASSOCIATION (with the government approval). Recently, I have even been elected to be the board chairman of Ving Tsun Athletic Association and become a member of Hong Kong Wushu Union. I am very glad to tell that one of my disciples has won the outstanding award in the 1999 Wushu San Shou Selection Match. I am quite pleased since I always aim at nurturing posterity enthusiastically so as to preserve the legacy of Ving Tsun and elevate Ving Tsun to a new height.